In the Restaurant industry cutting boards are typically constructed from polyethylene. Over time they can wear with knife marks and become discolored from the food and bacteria build up in the tiny grooves. Fortunately Gasket Seal offers 2 solutions to this problem. Custom made replacement cutting boards. We remove the minimum amount of the surface material to expose a fresh smooth surface free of dis-coloration and bacteria like it was when the cutting board was new at a cost of about 1/3 replacing them. We can typically resurface your cutting boards in less than 4 hours. 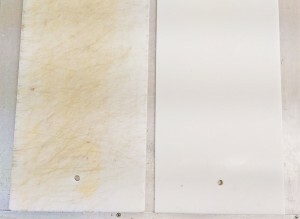 About 1/16 inch of material is removed from the discolored side(s) and a typically half inch think cutting board can be resurfaced approximately 3 time before it needs to replaced. We can resurface cutting boards any length up to 13 inches wide. Sorry we aren’t able to resurface boards wider than 13 inches due to the limitation of our equipment. Corners and edges are rounded after resurfacing for a professional and finished appearance. 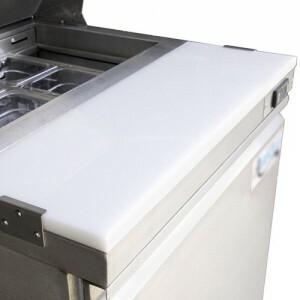 Note: Textured cutting board after being resurfaced are now smooth and customers may find them somewhat slick and slippery when compared to the board before they were resurfaced. 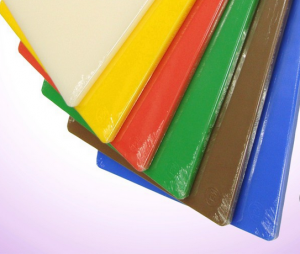 When it comes time to replace your old, worn cutting boards we have the major thicknesses and colors of polyethylene cutting boards in stock. Our Cutting board are typically ½ the cost when compared to purchasing cutting boards from the original equipment manufacturers. Our most popular cutting boards are the ½ inch thick white (opaque) polyethylene. But we can build a cutting board in any of the typical NSF colors. Cutting boards can be made any size up to 48 x 120 inches in size. Corners and edges are rounded for a professional and finished appearance. If your cutting boards require location pin holes or other custom requirement, we should be able to accommodate your special requests.